Bolstered by a team of prolific team members, we have been able to provide our valued clients with the best-in-class Metal Roofing Sheets. Note : We are looking for Buyers from Gujarat. Roof And Wall Cladding from the most attractive feature of our metal building and available in a variety of profiles and colors. Our cladding is flexibly deployed to cover roof and wall panels, interior roof and wall liners, partition panels, etc. 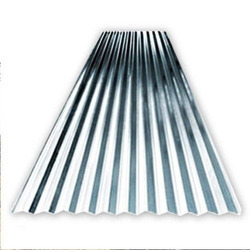 Ganesh - manufactures and supplies Trapezoidal Profile Metal roofing sheets in bare Galvalume / Colour coated Galvalume /Colour coated Galvanized with thickness ranging from 0.47 mm to 1 mm. Profiles are offered in exact cut to length upto 12 metres as per customer's requirement. We are a trader of Galvalume sheet from the thickness of .3mm to .6 mm.We provide Bare and Colour Coated Both.